Welcome to Terminal 3 of our travels to Destination Inspiration. It's me Shari (Ain't That Artsy Fartsy) and I will be hosting today's leg of our journey with my bags packed for, what will be for me, my final ride with the AVJ Creative Guides. 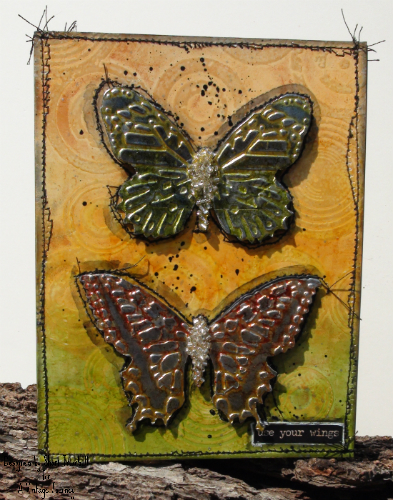 I gathered items of metal foil tape, Adirondack Alcohol Inks and matte & glossy stocks. 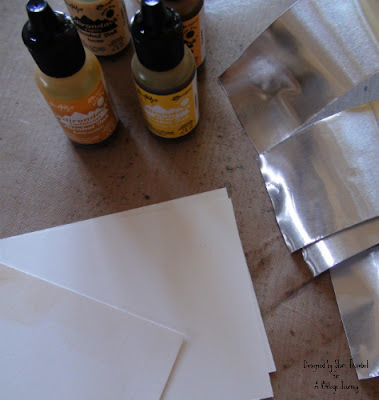 My metal foil tape is actual ducting tape-It works the same as any 'craft-grade' metal foil sheets, it's just short in width and there will be seams. Embrace Imperfection, right? 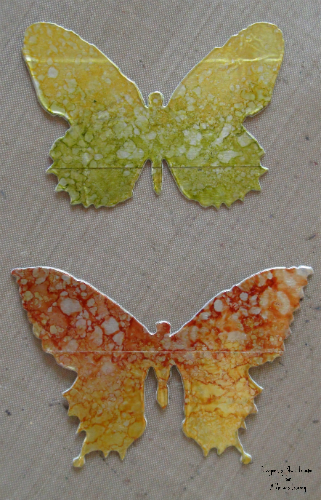 ...I die cut those pieces with Tim's Butterfly Duo die, and once these get run through their texture fade, the seams will be virtually invisible! Now onto the background. I'm using a piece of glossy stock and the grungy circles image from Tim's Psychedelic Grunge stamp set. I stamped the circles onto the glossy stock with Distress Embossing Ink and covered with clear embossing powder. I carefully heat set with my embossing heat gun, taking care not to get the tip of the gun too close to the stock, because the glossy stock can bubble. 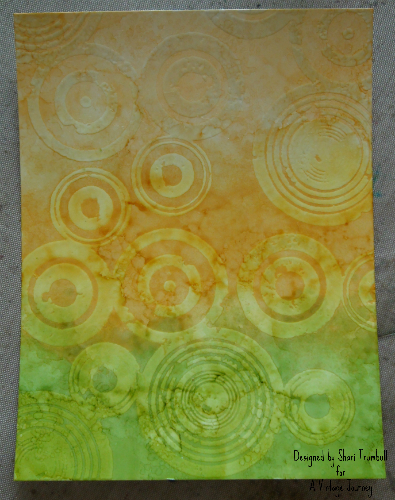 Here's the second place I used the AI Ombre technique--For my background, I used Sand, Butterscotch and Lettuce AIs. I applied each color separately then blended together using the AI Blending Solution. 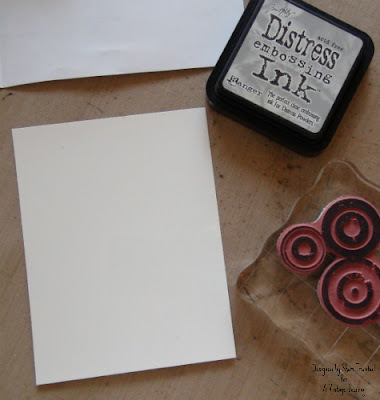 I rubbed the raised surface of the embossed circles with Coffee Archival using my finger. 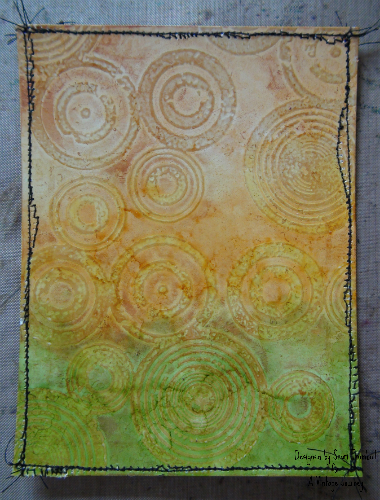 Then I ran the panel through my sewing machine to add the messy stitched border. I used a couple of extra die cut butterflies to use as my templates to machine stitch an outline, then I outlined the outline with my water brush and Black Soot DI. After running the butterflies through their texture fade, I glued clear seed beads to the bodies using Diamond Glaze. I added the butterflies to the surface along with a Small Talk sticker, attached the panel to a mustardy-brown card base and inked all of the edges with Black Soot DI and my ink blending tool. I've hope you've enjoyed this 3rd sojourn along our travels to Destination Inspiration. We'll be waiting for you at Terminal 4 next Monday--Until then, happy creative travels! Stunning Shari, what a great take on those travel ingredients, the background is stunning and I LOVE the way the butterflies turned out!! A gorgeous ombre background, and the butterflies are beautiful! Love the details to finish it off - the stitching and the splatters. We will miss having you on board, but I know our paths will cross frequently whether here or elsewhere. 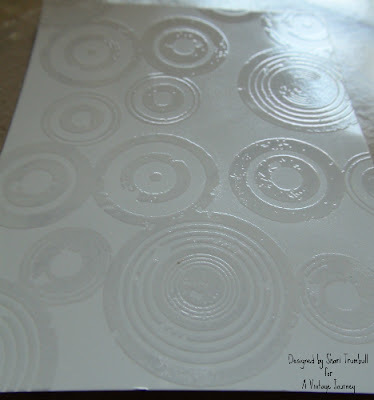 Shari, what a fab take at Terminal 3 and what a great idea to add in some clear embossing with your ombré effect. The stitching is super especially around your butterflies to make them pop. You will be missed but I do hope you can join us again in the near future. Shari, this final piece is stunning! I adore those butterflies and the background is gorgeous as well! I know you will be missed at AVJ. Hugs! Oh wow Shari - yep, I'm awe struck.... this is just INCREDIBLY MARVELOUS.... seriously WONDERFUL. j.
Shari your card is fabulous ! 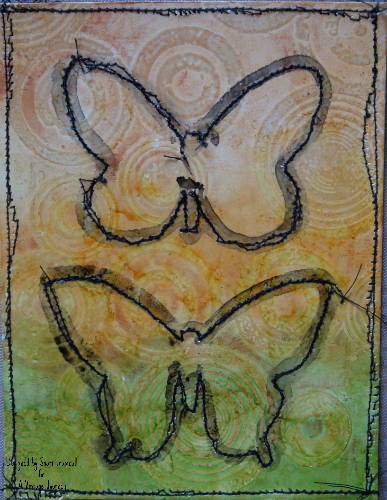 Love the way you colored the background, and adding the butterflies the way you did really make them pop. The details with added stitching looks gorgeous. Very impressive and creative. 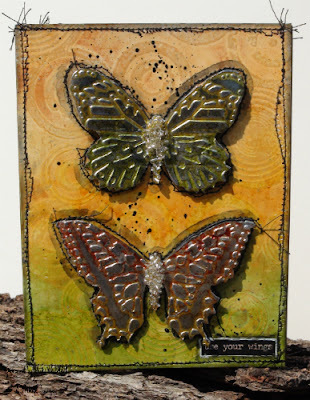 Fabulous and inspiring as always Shari x Love those gorgeous butterflies and that wonderful background. The stitching just sets it all off. Will miss you but its great to know you are still creating and that I can drop in at leisure to see what you are up to. What a lovely piece - the butterflies are stunning. Thank you for the comments on my card - actually, both of them came through, so you must have clicked the correct button both times! What an incredible piece for your staging post, I just adore the colours and design and the free stitching gives it a wonderful feel of freedom. Good luck in your personal journey Shari, we will miss you tremendously and hope you come back to the AVJ family one day. Take care. Wow....this is stunning and the combination of techniques is brilliant. Well done! This card is techni-colour glorious, with those beautiful colours which simply sing. Then to top it the fabulous butterflies who look right at home. Shari, it seems a shame you are leaving but I know that in your heart, it will have been a tough decision but one you knew you had to make. You will certainly be missed. Your card is gorgeous ! Shari adore your chosen colours and how you have worked them so fabulously together . Your stitching is a wonderful extra touch of detail especially the stitching round each of the butterflies .